The bigger casualty was the broader market as the S&P BSE Midcap index closed 1.6 percent lower while the S&P BSE Smallcap index slumped 2.2 percent. The S&P BSE Sensex which started on a positive note on Monday failed to hold on to momentum and turned negative for the fifth consecutive day in a row. The Nifty50 which broke below its crucial support placed at 10,550 managed to hold on to 10,500 towards the close. Indian market is witnessing sustained pressure due to rise in crude oil prices, weakening rupee and political drama unfolding in Karnataka which clouded the outlook for general elections next year and left markets uneasy. “A consecutive five-day sell-off breed bears as bulls are slaughtered with higher volatility and profit booking. A consecutive selling across the board was seen with only stock specific bullishness and PSU banks ahead of SBI results,” Mustafa Nadeem, CEO, Epic Research told Moneycontrol. “A loss of momentum is seen for bulls while bears capitalized due to multiple negative cues not just on the Domestic but global front as well. The fall of BJP in K'taka post-Yedurappa resignation is one of the reasons we have seen a sell-off while it is coupled with a consistent upward move in volatility which is now above 14.39 levels,” he said. He further added that higher crude oil prices in global front have also aided the fall and continued weakness in INR to above 68 levels has sparked concerns of fiscal deficit. Sectorally, the S&P BSE Realty index slipped 3.1 percent, followed by the S&P BSE Healthcare index which dropped 2.5 percent, and the S&P BSE Consumer Durable index declined 2.07 percent. On the gaining side, the S&P BSE PSU index rose 0.57 percent, followed by the S&P BSE IT index which rose 0.14 percent, and the S&P BSE Oil & Gas rose 0.10 percent. Top Sensex gainers include companies like SBI (up 2.4 percent), TCS (up 1.5 percent), Coal India (up 1.2 percent), ICICI Bank (up 1.1 percent), and ONGC (up 0.3 percent). 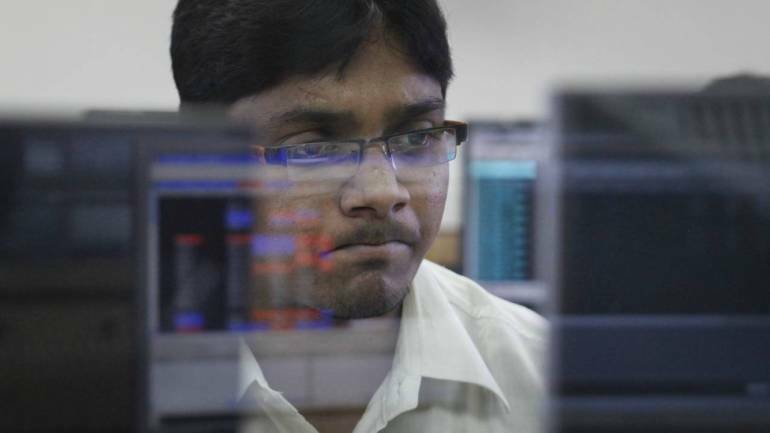 Top Sensex losers include names like Sun Pharma (down 4.5 percent), Dr. Reddy’s Laboratories (down 4.2 percent), Yes Bank (down 3.2 percent), Tata Motors (down 2.8 percent), and Tata Steel (down 2.4 percent). Nifty Midcap was down more than 300 points. About four shares declined for every share rising on the NSE. Jet Airways, BEML, REC, Adani Power, LIC Housing Finance, Glenmark Pharma, Ashok Leyland, Amara Raja Batteries, Kitex Garments and Strides Shasun fell up to 20 percent. Canara Bank, Union Bank, IDBI Bank and Balrampur Chini gained up to 7 percent. The acquisition of debt-laden Bhushan Steel, under the Insolvency and Bankruptcy Code (IBC) framework, will reduce bad loans of PSBs by Rs 35,000 crore, Financial Services Secretary Rajiv Kumar today said which had a rub-off effect on OSU stocks. Shares of Century Textiles and Industries touched a 52-week low of Rs 935 post demerger of its cement business. The board approved a scheme of arrangement for demerger of the cement business of the company into UltraTech Cement. The stock closed 5.8 percent lower at Rs 1004. Non-banking finance firm Indostar Capital Finance started off trade at Rs 600.60 on the National Stock Exchange, a 5 percent premium to the issue price of Rs 572. The stock closed 2.4 percent higher at Rs 586.10. Among the decliners, Amara Raja Batteries Ltd posted its biggest intraday percentage loss since Nov. 15, 2016, on missing analysts expectations for March-quarter results, said a Reuters report. Shares of Petronet LNG lost 3.5 percent as the net profit fell over a percent at Rs 522.7 crore. Its revenues fell over 11 percent to Rs 8,636 crore. The operating profit fell 3 percent to Rs 822 crore while the margin was also lower than previous quarter at 9.5 percent. Shares of DB Corp gained over 6 percent as the firm will be considering a buyback issue on May 26.
Colgate Palmolive has reported a 32.4 percent increase year-on-year in March quarter profit at Rs 188.8 crore against profit at Rs 142.6 crore. The stock closed 1.3 percent lower. Kitchen appliances maker TTK Prestige has reported a 32.4 percent decline year-on-year in profit at Rs 37.4 crore for the January-March quarter against Rs 55.3 crore in same period last year. The stock closed 4.9 percent lower. Shares of Dilip Buildcon fell over 5 percent as company's promoters pledged their shares with RBL Bank. Avenue Supermarts fell nearly 5 percent for the second consecutive session after promoter decided to dilute some stake in the company to meet minimum public shareholding norms. Capacite Infraprojects declined 10 percent as the company reported poor numbers in the quarter ended March 2018. The company has registered 16 percent fall in its Q4FY18 net profit at Rs 22.38 crore against Rs 26.72 crore in the same quarter last fiscal. Shares of Indoco Remedies rose nearly 5 percent as USFDA has successfully completed the inspection at its manufacturing facilities. Leading stock exchange NSE has decided to delist Vijay Mallya-promoted Kingfisher Airlines and Plethico Pharmaceuticals and 16 other companies from May 30. This comes after BSE delisted over 200 companies from May 11 as trading in their shares remained suspended for over six months. Markets in Asia closed mildly higher on the back of developments around US-China trade. Nikkei 225 was up 0.31 percent to 23,002.37, crossing the 23,000 mark for the first time since February. Meanwhile, European markets have begun the day on a strong note as investors here too are taking note of US-China trade wars being on hold. FTSE 100 was up by 0.9 percent and the CAC 40 in Paris was higher by 0.7 percent.